Can you turn back that Time? The place that I worked are rather small to get own despatch to run errands for the office. Anyway if hire one it will be another headache to manage them. Odd job such as pick documents and all those running around task totally need someone reliable to do it. Can you find someone reliable easily? If you get one...can anyone vouch they are reliable? Anyway, for small thing like running errands that can save my time, I would rather spend some on this to eliminate unnecessary obstacle in performing my paid day job. 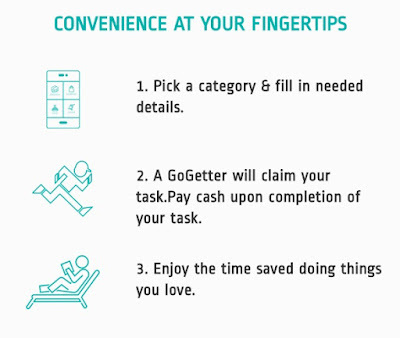 I installed goget.my since last year but only have faith to use them because I am so desperate and no choice to deliver some important documents but unable to duplicate myself at the same time. Of course after reading all those good comments online drive me to gamble my clicking fingers to post my first job poster. 1st errand posted - deliver documents within an hour. I got my gogetter within less than 5 minutes. Its a guy who drive a Suzuki Jimny. I met him at lobby of my office building. Kind of professional. My receiver received the document within half an hour after it was collected from me. My 1st gogetter save my time! 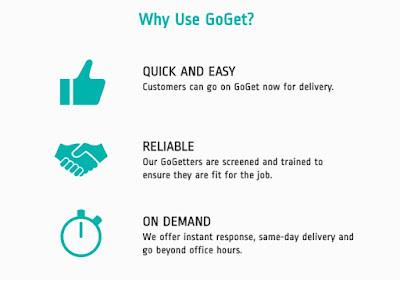 2nd errand post - deliver documents within an hour too .I got my gogetter within less than 5 minutes too. A girl who drive Viva waiting for me at the Lobby. My receiver even praised her for her professionalism to making sure she deliver it to the right person. YES! I got the documents delivered less than half hour. 3rd errand post - deliver document within an hour too. I got my gogetter within less than 5 minutes too. This man suppose to collect the document from another office and deliver to my office. A little hiccups for this one but overall experience they are extremely reliable and honest. Most important all item reach you safely. All these tasks arrangement from my smartphone while having breakfast. Do you know that Goget is not about getting your document deliver? You can post an errands like buying eggs or milk, buy food for you, stand in line for you, doing research, data entry , paint your house or even set up an event for your romantic proposal to your beloved one. This is what you say money can save your time! Don't worry about getting a lousy or bad gogetter. Most gogetter are screened thoroughly by the GoGet.my team. They gone through a series of face to face interview , assessed on presentation, English proficiency, culture fit and background check. Each GoGetter went through training , sit a multiple choice test on navigation, communication solving skills , conflict resolution and culture. No time to run your errands??? 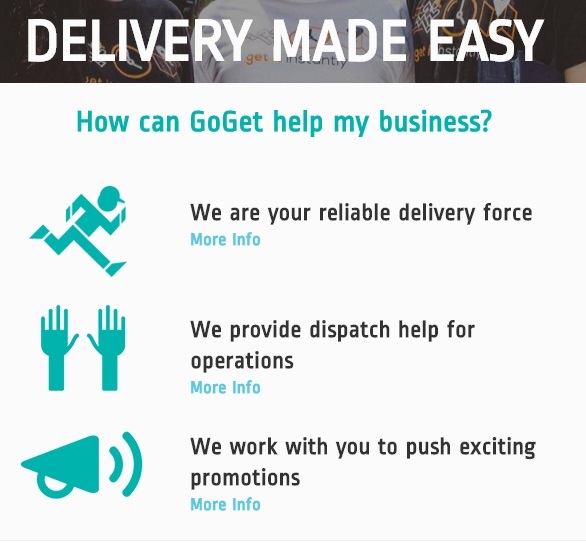 GOGET will got them done for your! 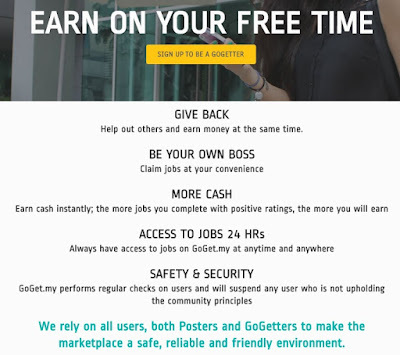 For students, freelancer or whoever looking way to earn some cash, become a GoGetter can be an alternative rather than wasting your time. For example a Part Timer at fast food restaurant earn like RM4 -5/hour. Being a GoGetter can earn at least RM10 maybe less than an hour errand. I paid my GoGetter at least RM10 to deliver a document at another office which is less than 5km away from me. The tips were paid cash on the spot! Don't you think this is good enough for a part time job? You have free time and don't mind running errands for busy people? Be a GoGetter and earn cash for instant! Disclaimer : Please note that this is not an advertisement. This write up based on my personal experience and just wanna share this with my readers who will benefited from this awesome apps. Hi Cik Syafiera oiiii!!! rather than stay at home not earning and chirp chirp for nothing.... Why not? 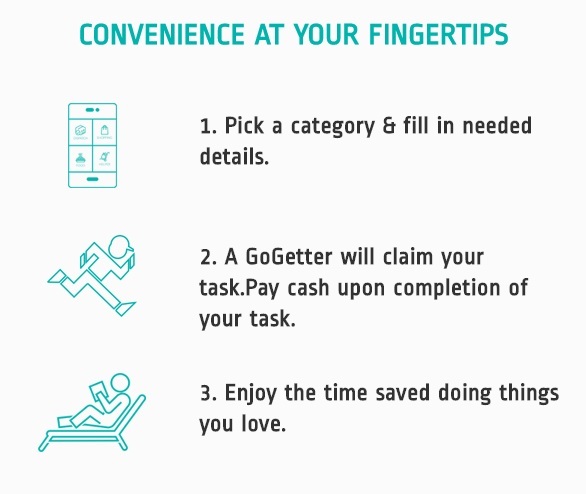 Well..this may be good opportunity for those who are looking forward to earn during their free time.It is a good service for those who are willing to tips people get thing done for them. Apps makes everything easier now. we had some similar apps in Indonesia too. save cost save time. bravo! First time heard about this. Nice review btw! 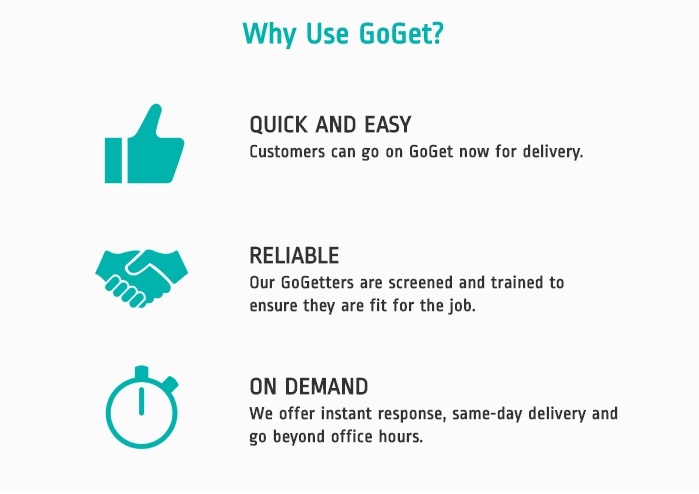 Good to hear that there is a new Co., GoGetter able to help us to run around instead of wasting our times there. Will try out their service soon. Thanks for sharing this!! I was about to buzz them next week for a delivery. Now I have all the more confidence :) Cheers! This is quite new thing to me as never heard about it earlier. sounds super convenient, definitely will try it out. First time heard of this. It sounds can help to save a lot of time. Thanks for sharing. I have try their service before. The delivery is punctual and I awards the delivery person with tips. I love how GoGet operate. Anyone can try this service or go apply also right! Looks super cool lo >< hehe I need it to help me take stuff when I am working. i love goget, especially their deals! i can even get a helper for my company's event from their platform too! it's very easy and convenient to use! Whoa not bad! I didn't know got such service! Thanks for sharing! I like this type of service, sometimes we need a freelance runner to run some errands for us. Didn't know about this app. Sounds very useful. Will download and try for sure.